Mitchell Rose Bear Don’t Walk said her family instilled in her the idea that she would go to college, and that she would use her knowledge to do good things. Her family’s accomplishments, as much as their words, showed her the way. Her mother, Eldena Bear Don’t Walk, who was born in Missoula and raised in Billings, was the first female chief justice of the Crow Tribe, serving from 2007 to 2011. Her grandmother, Marjorie Bear Don’t Walk, is Salish and is the longtime executive director of the Indian Health Board of Billings, and her grandfather, Urban Bear Don’t Walk, was only the second member of the Crow Tribe to earn a law degree, and was among the first American Indian attorneys in the United States. 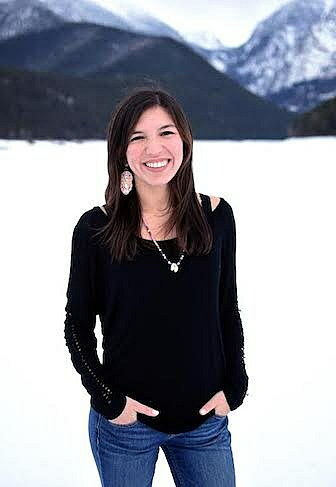 So perhaps it is no surprise that Rose, as she is known, who graduated from Yale University last year and is now teaching in St. Ignatius, was recently chosen as one of 24 members of the newly formed Tribal Youth Health Advisory Board to the National Indian Health Board. She and Abaki Beck, an enrolled member of the Blackfeet Tribe, will be the advisory board’s only two representatives of the Billings Area, an Indian Health Service region that encompasses all of Montana and Wyoming. The board is made up of two people from each of the IHS’s 12 regions. Bear Don’t Walk hopes her work on the advisory board will be an extension of the work she did at Yale, where she earned a bachelor’s degree in political science, with a focus on environmental policy. She and other Native students at Yale started the Indian Health Initiative, which promoted physical and mental health through a combination of nutritional, traditional food and exercise through participation in tribal games. An important part of her studies focused on “food sovereignty,” the idea that people should produce or have access to healthy, nutritional foods that are culturally relevant to them. “Reservations are not known to have the most healthy options available,” she said, going back to the days of commodities distributions that consisted almost exclusively of “westernized foods” that had nothing to do with traditional eating habits. Bear Don’t Walk, 22, was mostly raised in St. Ignatius, on the Flathead Reservation, where her mother had a law practice for years. Her mother is now the managing attorney in the public defender’s office in Polson. Marjorie Bear Don’t Walk said her granddaughter, though “a little girl compared to the rest of her family,” was always active in sports, academics and extracurricular activities. “You can’t say that she sits around,” she said with a laugh. Marjorie Bear Don’t Walk said she had nothing to do with the formation of the national youth advisory board, but there has been a need for such a group for many years. The widely recognized problems on Indian reservations, including family dysfunction, high dropout rates, suicide and poor health, “have to be solved by the people involved,” she said. Her goal is to eventually work with tribal communities on environmental issues, including resource extraction and food policy. “It’s a really, really tense but empowering time,” she said, referring to the recent fight against the Dakota Access Pipeline and other environmental battles on Indian reservations. In 2015, Bear Don’t Walk was awarded a Udall Foundation Congressional Internship and she spent the summer in Sen. Tom Udall’s office in Washington, D.C. That’s where she met Beck, who was also an intern. Bear Don’t Walk said it was completely coincidental that she and Beck both applied to serve on and were chosen for the Tribal Youth Health Advisory Board. Both women were planning to fly out of Missoula Thursday morning to attend the 2017 Native Youth Health Summit at Dartmouth College in Hanover, N.H. The summit will also serve as the inaugural meeting of the youth health advisory board. Since graduating from college, Bear Don’t Walk has been teaching Salish language at St. Ignatius High School, her alma mater. She said she learned just a smattering of Salish as a girl—and a few words of Crow while riding horses near Lodge Grass with her grandfather—but studied Salish by Skype during an independent language class at Yale. She said she is nowhere near fluent in Salish, but the curriculum she’s teaching from is the same one she used at Yale, so she is learning more and reinforcing what she knew every day. Although she wants to go on and do big things—she recently applied to a master’s program in environmental science at the State University of New York in Syracuse—she’s happy to be back in St. Ignatius, sharing her knowledge with kids in the school she attended. And that, by the way, was another reason she chose Yale: it has the same mascot as St. Ignatius High. “Once a Bulldog, always a Bulldog,” she said.